A young boy collects dried fish at the raft village in Phnom Penh, Cambodia. A Vietnamese-Cambodian community has been building their lives solely on the production of dried fish on the outskirts of Phnom Penh, trying to remember their origin while living in a foreign country. 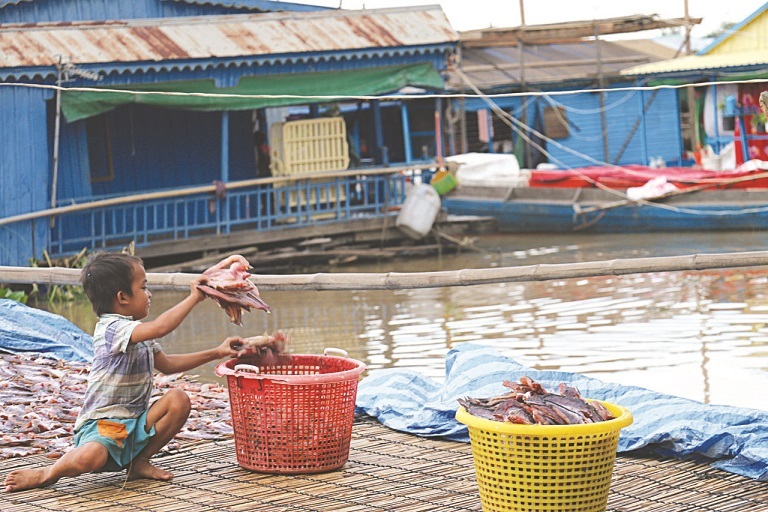 About 3,000 residents of a raft village, located in the outlying Prek Phnov district of the Cambodian capital, settle down along the Mekong River with their primary livelihood being dried fish production. Houses tied together to form rafts float side by side along the riverbank, each connected with the land by a makeshift bridge, often made from wooden planks or steel sheets. According to Pham Van On, head of the local people’s union, each raft costs at least US$4,000-5,000, despite their rustic appearance. Le Van Sau, 56, hailing from the southern Vietnamese province of Dong Thap, who has resettled in the Cambodian territory along with his five children, said that the fish were mainly imported from Vietnam. Producing dried fish is an easy job, Sau stated, adding that even young children from five to six years old are able to help their family out. “It is my daily task to lay the fish on the ground to dry them, just like playing with toys,” Nguyen Van Nam, a six-year-old boy, remarked. Nguyen Thi Nho, 52, whose hometown is in the Mekong Delta province of Bac Lieu, recalled that she has earned a living in Phnom Penh since 1979, along with her husband and four siblings. According to Sau, he was born in the Cambodian city as his parents had moved there a long time ago. Many Vietnamese people have chosen to resettle in the city for generations, living mainly on aquaculture. The Vietnamese community was forced to return to their home country in 1975 before coming back to Phnom Penh four years later, struggling to rebuild their lives. “Our life was basically stable up until the 1990s,” Sau continued. “As much as I want to live in Vietnam, there is nothing there for me to build my life on as my career and children are all here in Cambodia,” he added. Truong Thi Nham, 34, and her five siblings followed their neighbors from the southern Vietnamese province of An Giang to the Cambodian city many years ago, without knowing much about what life was going to be there. The orphaned sisters managed to earn a living by selling both fresh and dried fish, and later got married and started building their own families. Following decades of hard work, the Vietnamese Cambodians have been able to build a steady life, many of whom are now happy to see their children grown up and get married. However, the residents have not gone through a single day without remembering their hometown in Vietnam. Despite his limited budget, Sau still puts aside some tens of millions of dong (VND10 million = $440) every year to return to Vietnam for Lunar New Year celebration. Like some other families, he decided to send his 12-year-old grandson back to Vietnam for education. “He can stay in Vietnam if he wishes to. After all, we need someone in the family to preserve our root,” Sau said. Meanwhile, Nham has been teaching Vietnamese to her children despite being married to a Cambodian man.